A Fistful of Ghost Rock | SPACE-BIFF! A showdown going down between the Law Dogs and Sloane Gang. The setting of Doomtown: Reloaded doesn’t only push my buttons in all the right ways; it pushes one of my main buttons. Because I love Westerns. Ask any of my friends, chances are they’ve been bored half to death by me yammering about why the Western is America’s most timeless genre contribution, about how indebted Sturges and Leone are to Kurosawa, about what the Western genre means. Crime, pursuit, retribution. Anti-heroes, the wanderer, the displaced, the restless, the defeated Confederate hounded by his tormenters to the very ends of the earth and never finding peace — nor truly deserving it, so terrible were his sins. The honor-bound moral codes of the dispossessed, disinterested in justice and satiated only by vengeance. Deserts and plains so open and endless that they spill on without end, a dream landscape haunted by nightmare people. Regeneration through violence. An unbroken cycle of encroachments, whites into native lands, the raging entitlement of Manifest Destiny, and a melancholy coda as society and civilization kick down the door of that last abode of the rough-and-tumble. Man. I could go on. 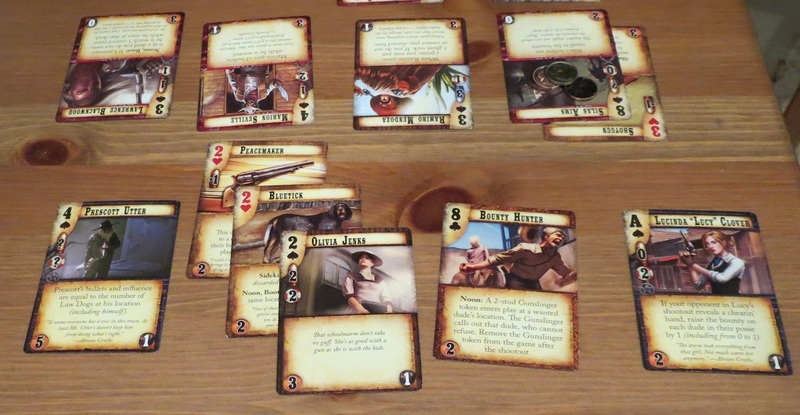 The thing that sets Doomtown: Reloaded apart is that it gets it. Not the whole thing — the Western is too broad a notion for any one work to “get” all of it, to encompass the whole spirit of what that timeless genre has come to express. But it gets a lot of little things right. Even though it’s set in the “Weird West,” where the lucky strike that propels the prairie town of Gomorra into the spotlight was magic-fueling ghost rock rather than gold, and where all that magic and shamanism and wacky technological advances are actual day-to-day tools in the hands of the wealthy and powerful — still, it does a pretty fine job of pulling off a Western. The Fourth Ring wants to cast some weird spells later this afternoon. Picture this. A game of Doomtown casts you as one of four bosses, and at least three of them do a great job of fitting you for a genuine pair of hole-ridden cowboy boots. At the start of each “day,” you sit down with the opposing bosses at some neutral location to play a round of cards. This works because each card in the game is given a poker number and suit, and this particular game of poker is lowball, so the weakest hand wins. It’s a “friendly” game, other than the fact that you’re glowering at each other across the table and the winner takes a bit of everyone else’s ghost rock. Fate is fickle. Then the bosses go their way to opposite sides of town square to take care of business. It’s sort of like in A Fistful of Dollars, where the town’s rival gangs spend their days staring at each other from across the square, sizing each other up for a fight, waiting for the right moment. There are the Law Dogs, these uppity punks who use the law to further their aims but break it the instant it becomes convenient to do so. Not that it matters, since they’ve got the judges and bounty hunters on their side. They’re that despicable sort of self-righteous pricks who fling their highfalutin’ notions about the “law” and “justice” in your face and smirk while they do it because they know they’ve just tied your hands through the confounding powers of bureaucracy. And that’s how they operate in actual game terms, by bogging down their opponents with penalties for “cheating” when they play poker, or putting bounties on people they don’t like. Next are the Sloane Gang, the guys who love stealing from everyone else. While the other bosses are home counting their dollars, these are the proactive folks who like to put themselves out there and rob a stagecoach or two, and will descend on your deeds and steal all your money. Third, there’s the Morgan Cattle Company, come in from out of town with all their fancy gadgets and high-value properties. Their dudes cost a lot of money, their equipment costs a lot of money… good thing they’ve got a lot of money. And the Fourth Ring… The less I say about them, the better. They’re circus freaks who cast magic spells, and… yeah. Okay. A theater troupe would have made more sense. Buffalo Bill’s Wild West, this is not. Lots and lots of rules. The Morgan Cattle Co. has become frustratingly powerful. I’m torn about Doomtown: Reloaded. It’s the sort of game that I want to love — desperately so — but there are two things that give me reservations about it. The first and more minor problem is that it’s possibly the most complicated card game I’ve played. There are special rules for pretty much every situation. Movement, for example, doesn’t exhaust a dude if he moves from a particular location to another, but can exhaust him if he moves back via the same route. Shootouts can draw dudes from adjacent locations to help out a friend, and jobs can draw them from, well, different sets of adjacent locations. And while none of this is all that difficult to figure out, it’s still strangely involved, and distracts from the actual task of controlling Gomorra. Suffice it to say, the base game comes with a tutorial scenario. Play it. The second problem is more pronounced. Ironically, the game embraces its Western setting perhaps too well, at least in the sense that fate can be fickle. That round-opening game of poker, for instance, can provide a huge swing in favor of its winner (and in a game where money is often scarce), and far too often the game can be won or lost based on the whims of one or two badly-played shootouts. It’s so chaotic that at times, especially when playing with four players, somebody won because two other gangs were fighting it out and lost too many guys to prevent that last player from winning. Which, sure, is very possibly attributable to how crummy we are at the game, but there’s often so much going on that it’s easy to dedicate yourself to a fight — to prevent one player from winning — only to inadvertently propel someone else to victory. On the one hand, that’s awesome, and very Western-ish, considering how often the anti-hero rambles into town and pits two local bosses against each other so he can ramble out again with a few extra dollars weighing down his pocket. But on the other hand, it does make for something of an anticlimax when this big long setup ends suddenly. Even when I’ve come out the winner, it’s usually been because it just happened rather than because I really earned it. Lots of buildup, a firecracker pop, then it’s over. At least in nearly every one of the matches I played. Unfortunately, the two-player game still suffers from many of the same problems as the more hectic three- or four-player game, especially the issue of large swings based on luck rather than preparation. I’ve had some tremendous matches of Doomtown: Reloaded. The problem is that they’ve been the exception rather than the rule. In the end, while I respect the hell out of Doomtown: Reloaded for its more innovative aspects and the spot-on use of its setting, and while I’ll be holding onto a copy for the setting alone and the occasional thrill of being swept away by the fun I’ve had with the game, the search must continue. Next time, we’re looking at Warhammer 40,000: Conquest. Posted on November 6, 2014, in Board Game and tagged Alderac Entertainment Group, Board Games, Doomtown: Reloaded, GenCon Loot. Bookmark the permalink. 10 Comments. As a former movie critic I was impressed, with your very accurate description of the western genre. And all together your writing skill is masterful. Looking forward to your Conquest review. God, what a great description of the Western. I’ve had a lot of fun with Doomtown, though I think you’re essentially right that it’s a very good, exceptionally thematic game, though perhaps a little too much of a Wild West for its own good. While I think it’s a great game, I couldn’t picture playing it in a tournament. Once you get you head around positioning and figure out that out moving you opponent is the key to victory the game clicks alot better. Well, I really ought to be clear that this isn’t a negative review, not by a long shot. I’m a fan. I just don’t have the time to commit to two major card games at this point. I have one friend other than you who was a big fan of the original Doomtown, and he’s of the opinion that this rendition isn’t as good, but I’ve heard the exact opposite from some other folks. Since you’re my go-to guy on all matters Doomtown, what’s your take? Ahh it’s a difficult call, the original card pool was far more diverse but that’s comparing a old established games swan song against a new release! The card pool will grow to take care of that issue. I miss a fair few of the old factions (The Sioux and Flock spring to mind) but that’s not really a big issue. Card cost balance seems better now with costs toned down but deed income dialled back as well. The Event cards have all gone, I did enjoy these and they were flavourful (These were cards that would only trigger if they were drawn as part of a lowball hard but would have turn long effects) They were such a minor part of the game I don’t think their removal is a bad thing although they were fun! Overall the game still run much the same as it did and once the card pool fleshes out a bit I can see all of (few) remaining qualms disappearing! I suspect I’ll still be getting the first few saddlebags expansions just to see how the game continues to evolve. A broader card pool can only do good things for Doomtown at this point. Pingback: More Than Only War: Conquest | SPACE-BIFF! Pingback: Best Week 2014, Day One! | SPACE-BIFF! Pingback: Old Blades, New Ideas | SPACE-BIFF! Pingback: Ashes: The Gathering | SPACE-BIFF!